Just days after Election Day, of course the election’s results were on everyone’s minds, and the shock and horror, fear and disappointment that much of America felt was very much present. Along with exhaustion. But there was also the perspective and resilience of organizers and fighters. 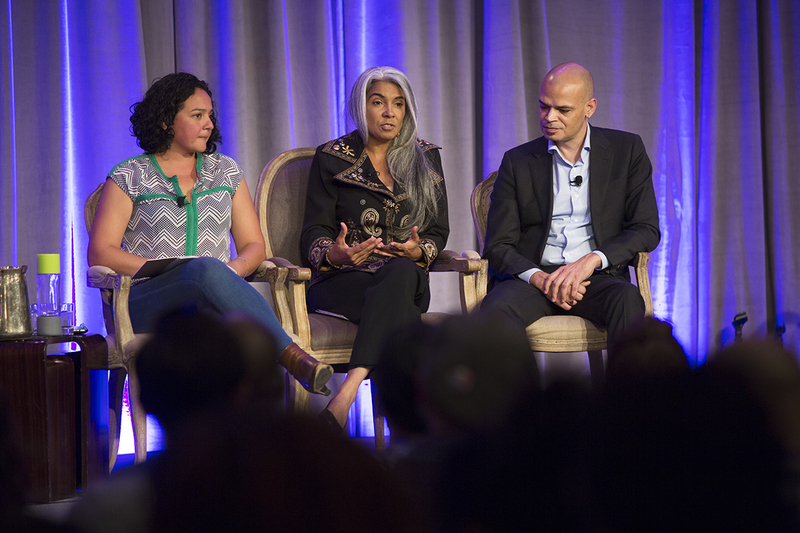 Unity within and among the various movements—queer, disabled, Black, Latinx, Asian, Native, Muslim, Jew, undocumented, and women—being needed now more than was a major theme of the conference. The final panel of the event was set aside for discussion of “Where Do We Go from Here,” which I’m sure was a very different conversation than the one the panelists were expecting to have when they signed up. The panel was moderated by Van Jones, president of Rebuild the Dream, known for his work on expanding “green-collar jobs” and connecting them to those who need them most. Jones is also a CNN commentator and joked about how relieved he was to be on stage without a Trump supporter on either side of him. Jones cautioned the audience against the despair of that position, noting that “His coalition is not as stable as it was. This is not a Republican takeover. It’s an alliance between populists and conservatives, and they don’t agree on everything. (Though they agree that they hate us. )” He brought up the Trans-Pacific Partnership trade deal and privatizing social security/Medicare as items where Trump breaks from his hard-right Republican colleagues. Even if you aren’t feeling that generous, Jones reminded everyone that as racial justice advocates, “We are less alone now than we’ve ever been,” reminding them a majority of voters voted against him, and that “tens of millions of white people are shocked and heartbroken,” and tens of millions of people of color are kicking themselves for not voting. “I’m convinced that if the organizations in this room want to go big and beautiful and amazing on opposition, I think you will be shocked by how responsive our allies are,” he offered. 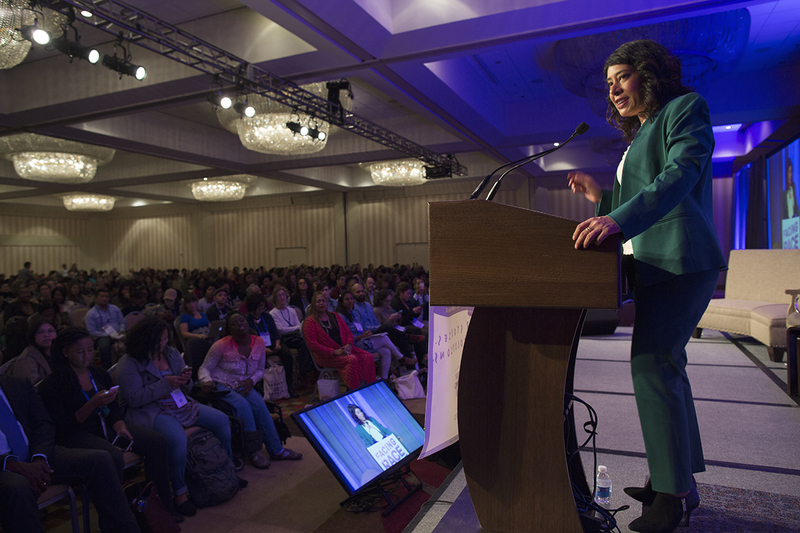 Pramila Jayapal, a Washington state senator who was just elected to the House of Represenatives (as the first Indian-American woman to serve there), reminded the audience of some silver linings, such as the fact that Arizona, even while going for Trump, also raised the minimum wage and kicked out the notoriously anti-immigrant Sheriff Joe Arapio. “There are a lot of women of color getting elected,” she observed. “I’m focused on local elections in 2017; then in 2018 we have an opportunity to Tea Party them,” she concluded. It’s been hard on the left to get to a shared agenda, said Franco. “How are we going to get to a shared agenda if we don’t feel like we’re going to have a shared political fate?” said Franco, trailing off with a very clear implication that now we all do. 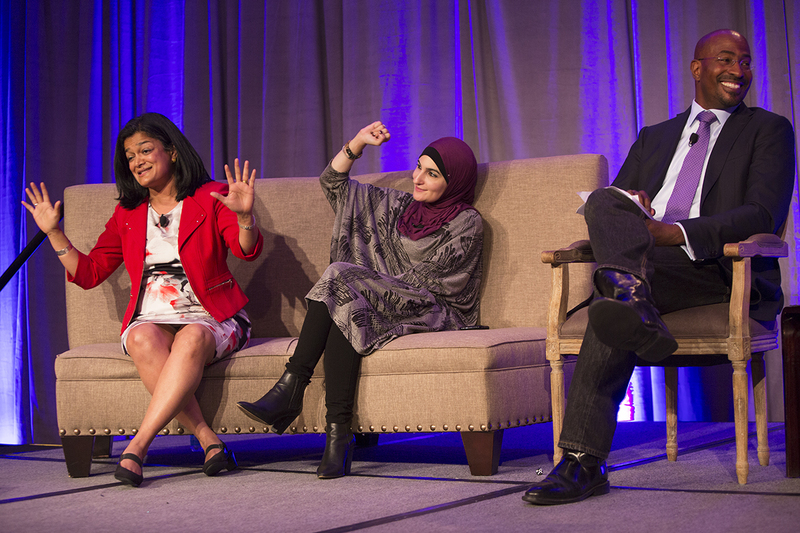 One theme of the panel, also taken up by Rinku Sen, director of Race Forward, which put on the conference, was one that is fairly controversial among anti-racist organizers in the election aftermath—whether all Trump voters should be written off as hopeless racists because they were willing to overlook so much racism in voting for him. “There’s elitist blind spots on our sides, and bigoted blind spots on their sides,” he said, “But the strange thing is that idea that voting for someone who is bigoted makes you racist is consolidating the Republican coalition.” Jones actually feared that that consolidation might make it more difficult to capitalize on the inevitable moment when it becomes clear that he can’t deliver on the economic promises he has made. “I cannot just roll my eyes and let the autocrats have my people. People don’t know that you don’t have to be intentionally hateful to cause damage for people of color, women. . . My instinct with the Trump voter is to love on them so hard is that every time they turn around one of us there is inviting them to something. We have to stick to them like glue. Images courtesy of Race Forward: The Center for Racial Justice Innovation. Where Is Housing on the Ballot in California?